The title of this collection of essays poses a question: How can these three nouns be meaningfully linked by the preposition? The answer offered in the introduction does not really help: The aim of this book is to merge the two fields of bioethics and law (or biolaw) through the literary text, by taking into consideration the transformations of the concept persona at which we have nowadays arrived (p. 9). Why would two closely related fields need to be merged, and why by literature? 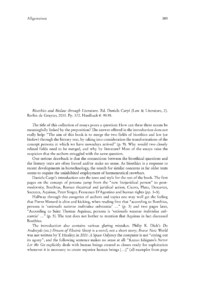 Most of the essays raise the suspicion that the authors struggled with the same question. One serious drawback is that the connections between the bioethical questions and the literary texts are often forced and/or make no sense. As bioethics is a response to recent developments in biotechnology, the search for similar concerns in far older texts seems to require the uninhibited employment of hermeneutical crowbars.